Stepping Stones is a journal writing exercise developed by Ira Progoff. He conducted research about how individuals develop more fulfilling lives. In his role as psychotherapist, he found that clients who wrote about their life experiences were able to work through issues more rapidly. Through this research, he then developed and refined the Intensive Journal Method to provide a way to encourage the processes by which people learn, grow, and develop as individuals. I have adapted his Stepping Stones process to use in reflecting on your travels. 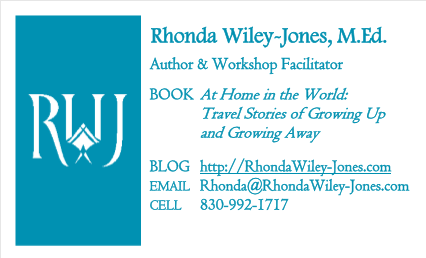 It is particularly useful in writing a memoir or learning to explore the world more intentionally. Give it a try! I find hospitality with M&M. Questioning: How did I get in this mess? Obsessing: I should have; I could have; I better not next time; Why, what, how? Now what? It will get better. This can’t continue for another week. Just keep going. It will get better. If it doesn’t, I can go home early. I’m tired of making decisions alone; I’m ready to go home. My Achilles’ tendon is pulled taut. The backpack seems heavier each day. I’m exhausted; I no longer am rested when I wake up. Now review your lists above as a holistic view of that experience in your travels. Writing about an episode in time helps you recapture the journey that shaped your response, reaction, or reflection that may, in turn, have influenced your destiny. Start your summary with these words, “It was a time…” Writing can help you learn from a missed lesson; one you did not fully absorb; and/or guide you to be intentional in the future. See my summary as an example. It was a time when my body was breaking down from the amount of walking and carrying weight with which I was unaccustomed. It was a time when train schedules fell apart because I didn’t know about national holidays. I was lonely with no one to help make a decision whether to stay or move on. I had wanted this trip to serve as another marker of independence. I had looked forward to it and now was so disappointed in myself—hoping for a good ending. I came to question every move I made or didn’t make. I obsessed questioning myself and berating myself for not being up to the adventure. I felt my confidence wavering and I felt defeated by one happenstance after another that wouldn’t let me enjoy the rest of the trip. I just wanted to go home. But being a never-give-up kind of person I didn’t want to give in. That was not the picture I had of myself. I decided to let the cost of going home or staying make the decision for me. That too didn’t work. It came out a wash. So, in the end, crying on a park bench in London I made the decision to go home. I wondered what people passing by must think of this crybaby. It was not the picture of myself I had in my mind when I left home. You can see from the example of my troublesome trip that this writing exercise offered insight into myself. The trip had crippled my body and as a result my view of myself as a confident young woman striding through the world. I literally limped home early. What this activity does not show is the pride I carried back with me, nonetheless, because I had walked the length and breadth of the United Kingdom. I had accomplished it, though with a different end in mind. Try this journal writing exercise and see what results you find. Then share with me and others what you discover. I’m eager to hear from you.